Use the drop box menu to add your selection to your shopping cart below. To order more than one return to this page to add additional palettes to your cart. Most watercolor artists LOVE their watercolor paint! They like to "see" the colors explode as they hit the wet paper. experimentation. 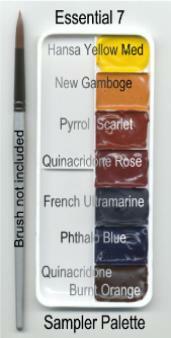 Susie's Sampler Palettes are a great way to try watercolor without making a huge investment in watercolor paint. Filled with Daniel Smith Extra Fine Watercolors selected by Susie, each Sampler Palette is personally prepared by hand. Please allow two weeks for preparation and shipping ... it usually doesn't take that long ... but just in case! I use for my own paintings and in all of my workshops. I make these sampler palettes for you to test the paint colors to see if you want to add them to your own palette. store either online at www.danielsmith.com or call them toll free 1-800-426-6740 or stop by their store and let the friendly staff assist you. And when you do....tell them Susie said hello! Sampler Palette - Brushes - Paper Pack - Just add water! paint to dry before using them for my paintings. I look for a large open mixing area without speed bumps or sections. The lids on the covered palettes act more as a dust cover and are excellent for additional mixing areas. These are the two studio palettes I've used and recommended for the past three decades. empty and ready to fill with your favorite paints! time to dry before packaging. Please allow 7-10 days before they ship.